If you are a restaurant owner, food critic, or just an ordinary consumer that appreciates the pleasure of dining at a restaurant every now and then, you probably assume that, in most restaurants, the kitchen and dining area get cleaned several times a day. But have you ever considered what about the air duct system? As a Customer, Why Should I Care? The ventilation system directly affects the quality of air in a business establishment. Most people are very sensitive and may have an adverse reaction to dust, mold, and other contaminants that have built up in the ducts over time. As a Business Owner, Why Should I care? Usually, when a person sits down to eat in a restaurant they can immediately tell if the air quality is bad. They may not be able to put their finger on what exactly it is they're feeling, but they'll know it's not good. More than likely they'll get a "dirty" feeling, which is something no restaurant owner wants to be associated with their establishment. Restaurant goers do a lot of looking around while they are seated at the dinner table. That is probably the reason that restaurant owners place a lot of time and money in the décor, lighting, furniture, carpet, and other factors that contribute to the particular scenic ambiance they were going for. However, if a customer looks around and sees the dust and the cobwebs on the vents, it can really spoil the effect. Not to mention, make them think twice about the food. Dirt on the grills of the vents indicates that there is likely dust and who knows what else in the air as well. The last thing a restaurant owner wants is to have their diners wonder if floating dust particles have gotten into their food and drink. All this can be all avoided by having the air ducts and HVAC system vacuumed and treated periodically. How Bad Could it Get Exactly? Some people react differently than others. For some, their breathing might be affected whereas others may get a headache or congestion. There have even been instances where the unclean circulation has triggered people's asthma, causing them not to want to come back to that particular restaurant for nothing if not for fear of having another "attack". 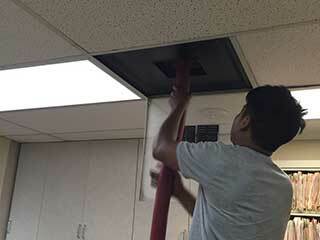 As a business owner, you can avoid these off-putting – not to mention potential health risk inducing – situations by calling our team at Air Duct Cleaning Canyon Country to have our specialists take care of both your air ducts and your HVAC system.